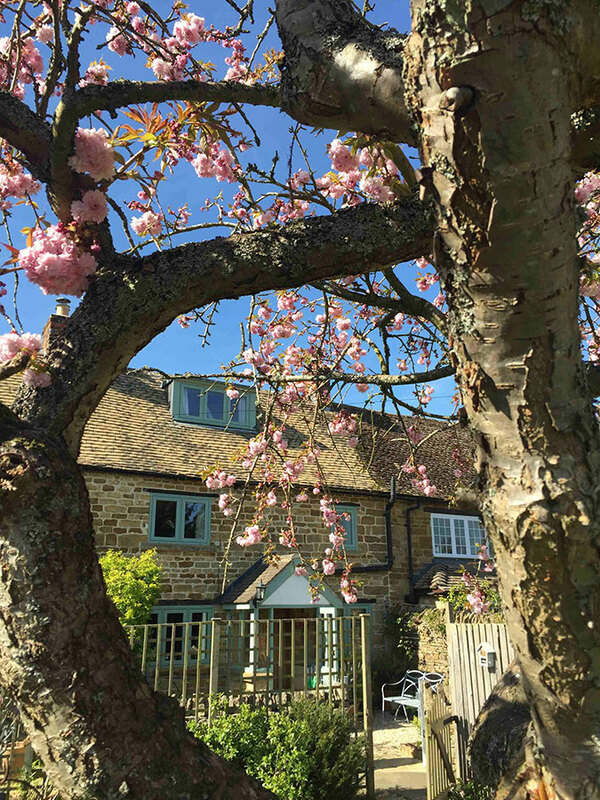 Margot from Cotswold Village Rooms writes…..
March blows in and out with cumulus clouds, clocks going forward, blue skies, linen-white snowdrops, daffodils of all shapes and hues and just a hint of blossom and scent between hedgerows. What a lovely month to pack a few things, plan a route, and pick some perfect places to stay in honey-stoned villages and hamlets in the Cotswolds. The month starts with a surprise. A celebratory bottle of gin arrived from the generous chaps at Riley & Thomas in Broadway followed by a trip out to Cotswolds Distillery in Stourton, near Shipston on Stour. What a treat to see the gleaming and beautiful copper stills made by Forsyths in Scotland, to hear how the gin is made and the recipe that makes this first ever Cotswolds gin so unique. So much of this enterprise is done by hand which makes it even more special. A hankering for baking and bottling has taken over at this end. A journey out to the amazing Jolly Nice Farm Shop stylishly converted from an old petrol station at Frampton Mansell is necessary. Returned with basketful of local veg, a bag of quinces and baking that was not my own. It’s a must to go out of your way to visit. Apparently, there are more recipes for quinces in seventeenth century English cookery books than for any other orchard fruit. www.historicfood.com/Quinces Recipe.htm Following a simple recipe, two, glowing, rose tinted pots of quince jelly took a whole day and into the evening to perfect. Without cheese it meant spooning onto an oat biscuit instead, but I glowed with a sense of perseverance and pride. Cotswold villages are just perfect for taking off and heading to a weekday or weekend event. A chalked up blackboard and sign by the roadside pointed the way to a fabulous Vintage and Artisan Fair in the lovely village of Little Barrington. With the village hall decked with bunting and tea and cakes available many visitors and stall holders had travelled miles for this local annual event. The month happily led to a visit to York House, in between the villages of Churchill and Kingham to meet owner, Ewa and delightful Piglet, a young Cocker Spaniel who just loves guests to stay at this luxurious bed and breakfast home. As well as some fabulous places to eat such as The Kingham Plough and The Wild Rabbit, the village of Kingham hosts the quarterly Cotswolds Table market on the village green. It’s a “foodies market with a difference” with a gathering of some great local producers. www.thecotswoldtable.co.uk My tip for the month is to plan a long indulgent weekend away from home, and head out to the next market in June.